Home News Ieng Sary’s Death—Another Nail in the ECCC Coffin? Ieng Sary’s Death—Another Nail in the ECCC Coffin? With former Khmer Rouge foreign minister Ieng Sary now dead, his wife Ieng Thirith freed, and their Pol Pot regime colleague Nuon Chea in and out of the hospital, the work of the Extraordinary Chambers in the Courts of Cambodia (ECCC) appeared to lie in tatters on Thursday. After months of illness, Ieng Sary, 88, died of cardiac failure Thursday morning at the Khmer-So­viet Friendship Hospital in Phnom Penh. In September, Ieng Thirith, his wife and former social ac­tion minister during Pol Pot’s regime, was declared mentally unfit to stand trial and freed. The remaining two war crimes defendants in the court’s Case 002, Nuon Chea and Khieu Samphan, are 86 and 82, respectively. Nuon Chea has recently spent weeks in the hospital with bronchitis and other ailments including low blood pressure, while it has long been believed that the case against Khieu Samphan will be the hardest to prove. 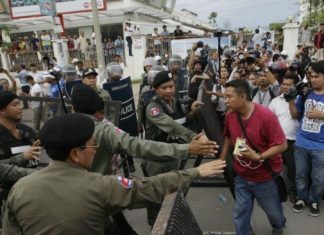 Setting aside the health and ad­vanced age of the defendants, the U.N.-backed court has been plagued with allegations of corruption, complaints of political interference by Prime Minister Hun Sen’s government, funding woes for the national component of the court and, most recently, an embarrassing strike by the tribunal’s unpaid national translators and interpreters. So far, the court—which started in 2007 and has cost $173.3 million to date—has secured a single conviction, that of Kaing Guek Eav, known as Duch, the former commandant of S-21 torture center and prison. Described by one court observer as a “garden variety” war criminal, Duch’s case was considered the least complex for the tribunal in terms of the amount of evidence left at S-21, and Duch’s own confession regarding his role in the killing of some 14,000 people at the security center. Case 002 is already proving far more challenging, while the investigation of two other cases, 003 and 004, which deal with lower ranking military and regional Khmer Rouge officials, are being resisted by Cambodian court staff and government officials. Asked on Thursday whether the hybrid court—which, per number of people accused, is the most expensive the world has seen—is failing, William Smith, deputy co-prosecutor, admitted that the tribunal was going through a rough patch. “It is fair to say the court is going through difficult times. When national staff are not getting paid, when an accused dies just before the end of a trial, when there’s been difficulty proceeding with cases 003 and 004, I think it’s fair to say the court has endured a difficult process,” Mr. Smith said. “But just isolating the fact that Ieng Sary died today, I don’t think that can be considered a failure of the court,” he said. That arrests had been made at all; that five suspects were made to stand trial—whether a verdict was reached or not—is already a sort of victory, he continued. “I think the biggest problem is that it [the court] started 30 years after the crimes were committed, but it’s important for Cambodia that that process was started” at all, he added. Commenting on the lack of cash, strikes by staff and political interference, Mr. Smith said such problems, while serious, would not derail the court. “We are confident with political will from the U.N. and the Cambodian government we’ll pull through this and start paying wages, people will see a free trial process, and maybe, just maybe, we’ll get to the end,” he added. Lars Olsen, legal communications officer for the court, said that with Ieng Sary’s death, proceedings against him would now end, though the case against the two remaining elderly defendants would continue. Some were not so sanguine. “I’m so disappointed because with his death, Ieng Sary escaped from justice,” said Chan Sopheap, a 62-year-old civil party from Kandal province who lost her father, two brothers and husband to the Pol Pot regime. “He should have been convicted, I wanted him legally named as a crim­inal for committing genocide and crimes against humanity. Now that he’s dead, he can’t be convicted, his case is terminated,” she said. Kim Huy, a 60-year-old civil party from Pursat province who lost 19 family members to the re­gime, said she was in tears over Ieng Sary’s death. “The other accused are old too, and I don’t know what will happen tomorrow, but I think this court has taken a very long time in prosecuting former Khmer Rouge leaders,” she added. Amnesty International urged the hybrid court to expedite proceedings, in a statement released Thursday. “Khmer Rouge Tribunal proceedings must continue without unnecessary delays,” the group said. “Amnesty International calls for an expeditious trial of the two remaining accused in this case, Nuon Chea and Khieu Samphan, with fair trial rights respected,” said Amnesty’s Cambodia re­searcher, Rupert Abbott. The tribunal has been fraught with delays. Between November 21, 2011, and the end of last year, there were only 140 days of court hearings, and so far this year there have been only 15 to 20 days of trial. “What should have been obvious to all was that if you are going to try octogenarians, you need to have a focused indictment and streamlined proceedings. This has been lacking at the ECCC,” Ieng Sary’s defense lawyer, Mi­chael Karnavas said. “Whether the ECCC has failed or was a failure, time will tell,” he added. Anne Heindel, legal adviser to the Documentation Center of Cambodia, said that while it was a “major loss” that Ieng Sary had died before there could be any res­olution as to his responsibility for the crimes of that era, the point of the court was not sole­ly to secure convictions. “What is the point of holding these trials? It’s not just to convict people, it’s also about educating people so that these crimes never happen again,” she said. “In terms of the way this trial was handled, there certainly were delays,” she added.